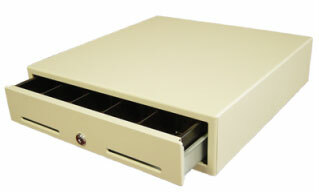 The M-S Cash Drawer J-423 Smart Series features an all steel construction, creating a secure and sturdy solution for your money handling needs. At 15.9" x 16.7" x 3.86" and approximately 20 lbs, the J-423 has the versatility and space-saving design essential for installation in most point of sale stations. Available with rs-232 serial, parallel, or usb interfaces, the M-S Cash Drawer J-423 is a versatile solution for virtually any point of sale location. The M-S Cash Drawer J-423-USB-M-B is also known as J-423-USB-M-B	or J423USBMB	.